Dependency is associated with nutrient deficits, and nutrient status plays an important role in the process of recovery in individuals with dependence. Nutritional deficiencies may add to the constant urge phenomenon and contribute to anxiousness and feeling low that may contribute to resistance to recovery. Supplements containing antioxidants, vitamins, minerals, and other nutrients are given to people recovering in detoxification programs. It has been observed that nutritional interventions may boost up productivity during detoxification by decreasing deficiencies. Our multi-vitamin and multi-mineral supplement was formulated by a Doctor - a Ph.D who picked the most effective ingredients needed that are lost during the process to replenish the body with nutrients, antioxidants, amino acids, vitamins, minerals along with research driven botanicals. GENERAL HEALTH & NUTRITIONAL SUPPORT -- Take Control is a comprehensive multivitamin and multimineral supplement deisgned to help shore up nutritional deficiencies one may experience with a diet lacking in specific nutrients. HABIT BREAKER -- When we try to break bad habits or cravings, often times, the body's nutritional profile or state is out-of-whack. Shoring up nutritional deficiencies can greatly assist your quest to break or quit any bad habits. HERBAL BLEND FOR COGNITION SUPPORT -- Take Control also features numerous herbal ingredients to help aid cognition and overall sense of well-being, including: L-Theanine, Kudzu Root, Guarana, St. John's Wort, Ginger, and Turmeric! WIDE VARIETY OF VITAMINS & MINERALS -- From Vitamins A, C, D, E & K, to minerals such as Calcium & Magnesium, and a B-Complex included too, Take Control has all the pieces to fill nutritional gaps. VITINITY - Brand you can trust! Vitinity quality control is second to none. Our ingredients are sourced responsibly, lab tested and verified, and what you see on the label is what you're ingesting in your body. 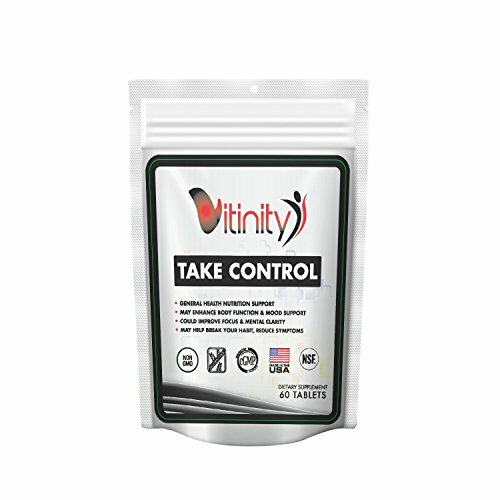 If you have any questions about this product by VITINITY, contact us by completing and submitting the form below. If you are looking for a specif part number, please include it with your message.